I-66 Tolls and Slugging: hit $46.75 for solo drivers: Although it has been a few months since the Washington Post reported the all time high of $46.75 for a solo driver on I-66, the tolls are still a good reason to start more slug lines along I-66. [Click here for info on the forum]. TMP Newsletter July 2018: Traffic Changes at Eads St; Temporary Relocation of Slug Stations Construction work continues at the “Pork Chop” and along Eads Street between the Pentagon Reservation and Army Navy Drive as part o f the 395 Express Lanes / South Parking Improvements Project. Construction began along the west side of Eads Street (existing southbound travel lanes) on July 16, 2018 to demolish concrete, widen pavement, install drainage, sidewalks, overhead structures, and curb and gutter in preparation for the 4th lane addition on South Rotary Road to access the future 395 Express/Toll Lanes. Duration of construction work on the west side of Eads Street will take approximately 6 to 8 weeks, or until early/mid-September 2018, subject to weather conditions. [Click here for info on the forum]. Transportation Advisory! 395 Express Lanes Project - Eads Street Construction Project Updates and Major Traffic Pattern Change Alert. Construction work along Eads Street between the Pentagon Reservation and Army Navy Drive has begun since June 21 to prepare for traffic signal installation and roadway improvement. The Eads Street construction work will be completed in several phases this summer and continue through the fall. [Click here for info on the forum]. DDOT Reviewing 14th & NY and L'Enfant Proposals! As of July 9th, 2018 DDOT is reviewing the proposal to relocate both the 14th & NY lines and L'Enfant. And a final decision is expected to be made by Tue, Aug 7. [Click here for info on the forum]. Results of DDOT Meeting with Slugs! The meeting with DDOT took place on June 19th five members of the slugging community and five DDOT officials. Purpose of the meeting was to discuss ongoing issues and concerns regarding 14th Street and L'Enfant. Many thanks to the five slugs who took the time away from work to voice our concerns! Visit the forum for highlights of the meeting [Click here for info on the forum]. DDOT Meeting with Slugs! DDOT has agreed to meet with slugs to discuss the challenges faced by VA slug riders and drivers. Seating is limited. However, we are hoping to gather a list of concerns to present to DDOT. [Click here for info on the forum]. Police Issuing Tickets to Slugs/Drivers?? : As recent as May 21st, it has been reported to me that police are threatening to issue tickets to drivers who stop for slugs at 14th and Pennsylvania. Earlier this month other reports were received for 14th and New York. Perhaps The District Department of Transportation can help! 14th and New York: Slugs and Drivers - are DDOT officials preventing you from slugging? There have been reports that police are not allowing drivers to pick up slugs. If this has happened to you, please let me know! 14th and New York: There is a "revival" of sorts for those travelling from 14th and NY to Bob's in Springfield. For many years, this location was one of the most active lines on 14th street but when DDOT move the line to the side street, it almost died. Reports are that it is on a rebound and growing. For those travelling to Bob's, please hold up a sign to let drivers know. Facebook Group for Springfield: There is a very active Facebook Group that focuses on Springfield slugging issues. Announcement: The Fairfax County Department of Transportation (FCDOT) and Department of Public Works and Environmental Services (DPWES) will host a community information meeting for sluggers and other commuters to discuss the Springfield Community Business Center (CBC) Commuter Parking Garage project on Monday, April 9, 2018, at 7 p.m. The meeting will be held at Edison High School in Cafeteria A, located at 5801 Franconia Road in Alexandria. At the meeting, county staff will present the revised ground floor plan and answer questions about the project. This event is rescheduled from March 22, which was cancelled due to weather. Slugging News Article: There is an interesting article that was published by the Washington Post last night that sumarizes the concerns about the new parking garage in Springfield. Will it help or hurt slugging??? What do you think? Get involved! Announcement! : Fairfax County Department of Transportation (FCDOT) and Department of Public Works and Environmental Services (DPWES) will hold a public meeting regarding the Springfield Community Business Center Commuter Parking Garage on Thursday, March 22, 2018, at 7 p.m., at Edison High School, Cafeteria A, 5801 Franconia Road, Alexandria, VA. The ground floor layout has been revised based on the feedback we received during our previous public meeting with the Springfield slugging community. Please see the link below for additional information. Attention!! : This website is NOT associated with the Facebook page "sluglines" in any way whatsoever! This person just created a facebook page that has a similar name to this website (slug-lines vs. sluglines), but I am NOT associated to him in any way! Please pass the word!! Slugging Survey Success! A very sincere thank you to the 966 slugs/drivers who completed the slugging survey! And, another thanks to the 336 slugs/drivers who expressed a willingness to participate in the upcoming slugging focus groups. Your responses are very much appreciated! More information will we posted here very soon on "Focus Groups". Attention!! Slugging Survey: The U.S. Department of Transportation is interested in expanding slugging! This is a great opportunity for the slugging community, so I would ask that you take a few minutes and complete the survey below. Please encourage other slugs, former slugs, and non-slugs to do the same. Together, united, we have a powerful voice! The U.S. Department of Transportation is interested in expanding casual carpooling (or “slugging”) in the Washington, DC Metro area as well as using local lessons to improve casual carpooling initiatives elsewhere in the country. As part of this effort, AEM Corporation is conducting an online survey that will inquire about your typical commute patterns, your experiences with slugging, and your ideas on improving slugging. The survey should take approximately 5-15 minutes, depending on your responses to certain questions. Your responses will provide valuable input into the research being conducted. We hope that you will take the time to provide your feedback on this important study to improve congestion in the area. If you have questions about the study or the survey, please contact Vicki Vuong at (703) 464-7030 x8207. New Message Board: We've upgraded our message board! With the growth and popularity of the board, the time has come to upgrade the message board software to a more powerful SQL platform. The new board will have the same basic features but with enhanced security, slugging specific profile, and an SQL backend for better performance. The most significant impact will be a requirement to create a new password. Your username will not change and all your previous post will remain, but you will have to create a new password. In addition, we ask that you update your new profile with your typical slugging origin and destination. Bob's and Cardinal Plaza: Updates made to these pages. Lorton VRE Expands Parking: On Thursday, Dec. 1, 2016, Fairfax County elected officials along with Fairfax County Department of Transportation and Fairfax County Department of Public Works and Environmental Services will host a ribbon cutting ceremony to celebrate the completion of the Lorton VRE Station Park and Ride expansion project. The key features of the project include 150 additional parking spaces bringing the total number of spaces to 717; new pedestrian connections to the existing park and ride lot; and lighting improvements. Herndon Expands Parking: On Wednesday, Nov. 30, 2016, Fairfax County elected officials along with Fairfax County Department of Transportation and Fairfax County Department of Public Works and Environmental Services will host a groundbreaking ceremony to kick-off the construction of the new Herndon Station Parking Garage. The 2,007-space parking facility is designed to assist in reducing congestion on Northern Virginia roadways by creating additional opportunities for ridesharing and the use of public transit. The key features of the project include a pedestrian bridge to the Metrorail Silver Line station currently under construction; vehicular and pedestrian connections to the existing 1,745-space Herndon-Monroe parking garage; and secure bicycle storage facilities. The $44.5 million project is estimated to be completed in the spring of 2019. New Ballston Mall Slug Line? There is a renewed interest in re-establishing the slug line at Ballston. Many years ago there was a slug line that somehow faded away. However, maybe it is time to bring it back!! Please vote on the poll to the right and/or comment on the message board thread. [Click Here for More Info] and [Click Here for Message Board Thread]. Forbes Article on Slugging: Check out this article in Forbes travel section titled "A Practically Free Alternative to Uber and Lyft You are Missing Out On" by Andrew Bender on March 10th, 2016. [Click Here for Forbes Article]. Note - for some reason you may need to click the link twice to get to the article. TPRTC Service Cuts and Fare Increases: PRTC has a budget deficit and is proposing service cuts and a fare increase starting in July 2016. Here’s a story that NBC4 did yesterday, focusing on how slugging could be impacted by PRTC’s proposals. [Click Here for NBC4 Story]. PRTC is hosting 4 public hearings in February on the proposed budget, service cuts and fare increase. [Click Here for PRTC Hearing Page]. PRTC Announces New Mark Center Bus Routes to Start February 1, 2016: Mark Center employees who live in the I-95 corridor will have a new commuting alternative thanks to the Virginia Department of Rail and Public Transportation (DRPT), when two new OmniRide commuter bus routes to the Alexandria facility start operating on Monday, February 1, 2016. The Potomac and Rappahannock Transportation Commission (PRTC) will operate the new routes, which will start in Dale City and Lake Ridge. Both Mark Center routes will offer four trips during the morning and afternoon rush hours, enabling a relaxing, convenient and environmentally-friendly ride in the I-95 Express Lanes and using the new I-395 HOV ramp at Seminary Road. [Click Here for More Info]. Washingtonian Article on Slugging: The January 2016 Washingtonian issue has a feature article on Slugging. It is now online and can be viewed by [Click Here for More Info]. Bob's: Bob's is expanding its destinations. 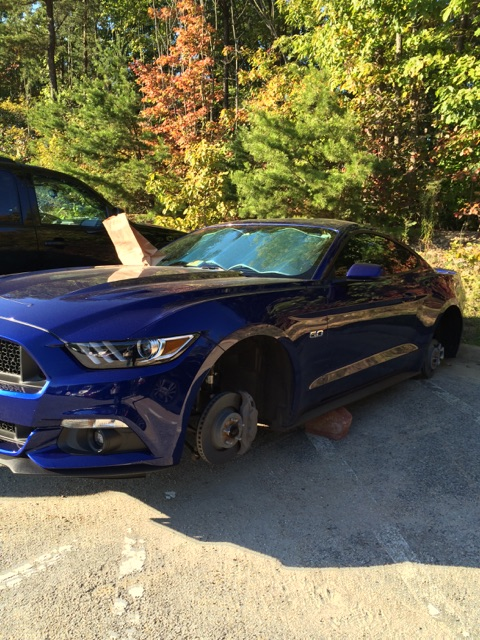 Some drivers are now picking up slugs for the Navy Yard! Thank You Phen! I wanted to extend a sincere "Thank You" to Phen for the donation to the website. 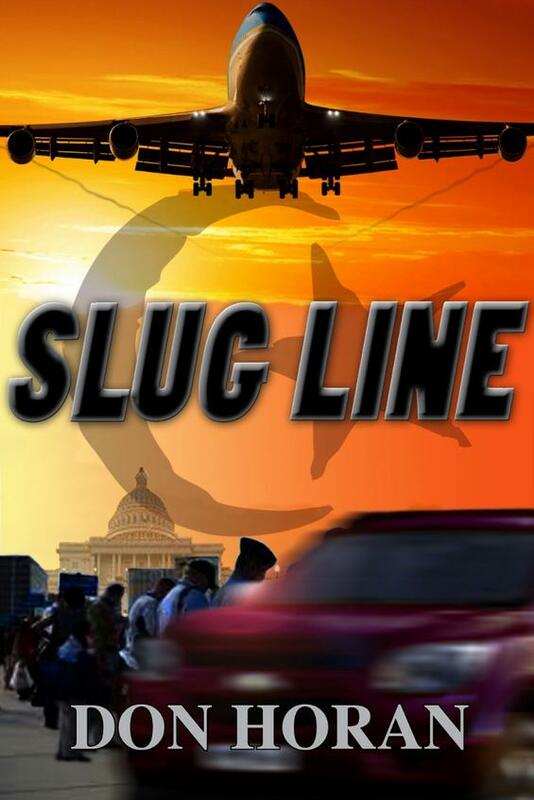 Unlike other forms of commuting that the government promotes, Slug-Lines.com does not have a multi-million dollar grant....so donations are welcome to offset costs! Slugs and drivers have the right to pass or forfeit a ride. Let’s say a couple of rough-looking characters pull up and your gut feeling tells you this ride isn’t safe. PASS. There are plenty of other rides that will pass your own personal "gut" check. This applies to both slugs and drivers. You are not obligated to get in a car or pickup riders if you do not feel safe! New Navy Yard Slug Lines - Starting Monday, 02 March, two Slug-lanes will be established on the Washington Navy Yard for afternoon commuters. This pilot is approved by NSA-Washington and will be facilitated by NAVSEA. 2) Rte 610 - Stafford. The slug line locations will be on Patterson Ave, the one-way (northbound) street on the East side of the Bldg 28 parking garage. Signs will be posted on the left-side sidewalk. The Horner road pick up point will be on the Northeast corner of Bldg 176, and the Rte. 610 pick-up point will be at the Northeast corner of Bldg 201. Lines should form to the West between the buildings, and not along the roadside sidewalk. Go to Webpage [Click Here]. New DC Line at Route 610! With the increase in slugging generated from the I95 Express Lanes, fellow slugs have suggested starting a separate line for the DC commuters. The proposed new line would be adjacent to the the new bus shelter at the North end of the 610 lot. More to follow! I66 Slug Line? A new slug line could be emerging on I-66! A fellow slug reported that he has been successful in picking up slugs from the Cushing Road Commuter Lot just off 234 in Manassas. He has even started a website to help get things started at www.66slug.com. More to follow! Message Board Corrupted!! I am not sure what happened but thousands of postings were deleted from the message board. I do not know how this happened but I had to upload my last backup of the forum database which was almost a month old. As a result, any posting from approximately January 6th to February 2nd was lost. I believe I was able to recover all new member accounts. However, if you have any trouble logging into the message board, just let me know. Again, sorry for the trouble. Book based on Slugging! A local author has written an exciting book based on slug lines. If you want to read an exciting novel that will keep you on the edge of your seat, pick up a copy of Slug Line! I just finished it and wow, what a ride! For more information on the book [Click Here]. HOT Lanes - Tolling takes effect on Dec. 29, all drivers in the express lanes will need to have a regular E-ZPass Flex or the E-ZPass Flex transponder, which can be switched in and out of the carpool setting. Standard HOV rules will continue to be in effect during rush hour until tolling begins on December 29, with the exception of holidays. Outside HOV hours, anyone can try the new Lanes for free. Message board thread [Click Here]. New 19th and 19th and I Street Slug Line! - A fellow slug has taken the intiaative to start a new slug line at 19th and I Street. This new slug line is to Old Hechinger from 19th Street in the evening. Click here for the flyer [Click Here]. Message board thread [Click Here]. Public Hearing and Vote Tonight! - Have you noticed all of the new apartments on Route 1? Tired of the traffic? Do you have kids in crowded classrooms? Are you concerned about slow police and fire response times with 911 calls? Are you concerned about higher taxes to pay for these and other government services? If so, please speak at the BOCS meeting on Tuesday night. We need you to say "no more apartments on Route 1. "We don't want 720 more Rivergate apartments." Can you help? If Rivergate is approved, we will be at 10,000 recently opened, already approved, and planned in Woodbridge on the Route 1 corridor. We will have a glut of apartments if we don't stop this now. Survey of Slugs Underway - The Virginia Department of Transportation will be conducting counts of commuters who slug in the I-95 corridor, beginning this week and lasting through the end of October. The survey will update a 2006 study on slugging activity. Commuters can expect to see a survey team at the some of the Prince William County commuter lots this month. Route 610 Commuter Parking Expansion Update - VDOT issued a press release announcing that they have postponed the traffic shift/slug line relocation at Staffordboro Boulevard Park & Ride for another week. The existing lot will remain open through 11 p.m. on Friday, Sept. 12. The new lot will open for the morning rush hour on Monday, Sept. 15. Click here for VDOT Press Release [Click Here] . Updated Maps for Horner and the New Telegraph Road Lot: The new Telegraph Road lot next to Horner has a functioning slug line to multiple destinations. Currently it servers as a "late" lot for just about all the destinations serviced by Horner Road. Thanks to Elizabeth for the help. Updated Maps Tackett's Mill: Hopefully of the next few weeks all the hand drawn maps for the slugging locations will be replaced with "real" maps as well as satellite images. This will be a vast improvement over the current maps on the site. Interesting on Google: While update the Tackett's Mill slug line, I notice that Google now labels the commuter lot as "Tacketts Slug Commuter Parking"!!! That shows how often users are searching for commuter lots to slug from! New Braddock Road / Mark Center Slug Lines: Thanks to Darrell for all the hard work in trying to formalize some newly forming slug lines. Here are the newly created pages on the website. Also, a distribution list has been used to help coordinate rides from the Mark Center. For more information on how this works visit the Message Board or [Click Here]. The Prince William County Police Department is seeking the public’s cooperation in correcting a safety situation at the Prince William Parkway / Telegraph Road ( Horner Road ) Commuter Lot. At the bus stops, passenger cars are co-mingling with the buses in the designated BUS ONLY lane during the morning rush. This is unsafe and forces the buses to stop in the travel lane, which further delays through traffic. The parking of vehicles on the back side of the bus stop islands may be contributing to this – the back side is traditionally where the informal slug lines made pick-ups. The parking of vehicles in this area is not inside of a designated space and will no longer be permitted. Violators will be ticketed and/or towed. Please help pass the word to other drivers and slugs. Thanks to everyone! - We were able to get enough volunteers yesterday to conduct the focus group! Thanks to everyone who responsed so quickly. We had a great session and received a lot of valuable feedback. I look forward to tonights groups! Volunteers Needed for today's (Tuesday) Ft. Belvoir Slug Survey!! - On behalf of the US Department of Transportation Federal Highway Administration, NuStats Research and Consulting will be conducting focus group sessions about Slugging (May 22nd, 2012). You are invited to participate! You can expect the discussion to be lively and interesting. Additionally, those who participate, will receive a free lunch their time. New Rt. 208 Fredericksburg Slug Line! - A new slug line has emerged at Route 208 in Fredericksburg. Slug line information is located on the new Rt 208 webpage. WMAU 88.5 Kojo Show - Slugging the focus of the Kojo Nnamdi Show on WMAU 88.5 FM on August 4th, 2011. This was a great hour long live radio segment about slugging. The host, Kojo Nnamdi, did a great job covering every aspect of slugging. The show had representatives from Arlington County, VDOT Mega Projects and myself. Click Here to read the transcript or listen to the taped broadcast. The good news is that Prince William County has a new lease for 222 parking spaces next to the existing Lake Ridge Commuter lot on Minnieville Road. This new commuter lot will we able to use the existing bus service already provided to the Lake Ridge Commuter lot. The new temporary lot will open on Monday, July 11th. [Message Board Thread]. Fairfax County Announces Changes to Bob's - July 18th - Fairfax County has announced changes to the commuter lot on Old Keene Mill Road where the Bob's slug line is located. Fairfax County solicited input from slugs on the changes back in March 2011 (see message board comments). The decision from Fairfax County was a revised traffic flow that is best described by the traffic map. Please see the website or the Fairfax County webpage for details. Update to Rt. 234 Dumfries - Crystal City destination added to the Rt. 234 Dumfries slug line! CNN Story on Slugging! - CNN aired a great story on slugging yesterday (May 31st). The focus of the story was that slugging could save you time and money. Something to consider with rising gas prices. See the video link on the [Message Board Thread]. Comments on FBC and Rt. 123 Needed - If you have feedback on the new First Baptist Church or Rt. 123 Commuter lot slug lines, please post them to the message board. Are these lines working??? Newsletter #19 - There latest edition of the Slug-Lines.com newsletter was sent to all subscribers to the newsletter on April 30th. It contains information on the newly proposed slug lines and the OmniRide shuttle bus service. To view Newsletter #19 click here! Update to First Baptist Church Parking - There has been a lot of progress towards improving slugging at the new FBC Commuter Lot. PRTC/OmniRide will begin a "shuttle bus" service from Horner Road Lot to FBC beginning May 2nd. As a result, slugs will have a way to get to FBC is slug rides are not available. More to follow as this develops. Domino Effect from Potomac Mills - The reduction of parking spaces at Potomac Mills has caused huge problems at virtually all the other commuter lots with slugging. Old Hechinger's and Tackett's Mills lots are full by approximately 8:15 am. As a result, many slugs are suggesting new lines at the 123 lot. A new poll will be created today to gage interest. Please comment on message board. I understand that these changes may not be ideal for everyone and will certainly inconvenience virtually everyone as we try to sort this out. However, it is very important that we pull together to make this work. Otherwise, it is going to take a bad situation and make it even worse. If you are Pentagon, Rosslyn or Crystal City slugs or drivers, please use the new location. Options for Potomac Mills - By noon today, Feb 11th, I will propose two options for the Potomac Mills Slugs. Basically, one line will stay at Potomac Mills and the other two lines will shift to a new commuter lot. Please visit the message board for details. This is going to be a tough transition with so little time, so we need to come together. Outcome of Town Hall Meeting - The Potomac Mills commuters were well represented last night at the Town Hall meeting co-hosted by Supervisor Frank Principi and Occoquan District Supervisor Michael C. May. Many thanks to all the Slugs that participated and voice their concerns regarding the loss in commuter parking spaces. The meeting which began at 7:00 pm, lasted until approximately 11:00 pm, as commuters took the microphone to voice opinions and ask questions. I think many were looking for the answer to the question: "Where do I go on Monday, Feb 14th for my morning commute?" Unfortunately, there just aren't any easy answers. Suggestions were made to use the Kmart lot, the Gemini commuter lot or the 123 lot, but every option had issues. Near the end of the meeting slugs seemed to just want somebody take a leadership role for the slugging community and make a decision. As the webmaster, I have tried to allow the "system" to regulate itself but this may require intervention. Over the next 24 hours I will try to coordinate a solution but with only one working left before the Monday changes, this is going to be a challenge. Thanks again to everybody who attended the town hall or has offered solutions on the message board. Commuter Parking Town Hall Meeting - Supervisor Frank Principi will be co-hosting a town hall with Occoquan District Supervisor Michael C. May, on February 9th, at 7:00 pm, in the Ferlazzo Building in the Auditorium to discuss the impact of Potomac Mills decision to limit the number of parking spaces available to commuters. We will be joined by County staff, VDOT officials, and PRTC officials to discuss the options available and to receive feedback from area commuters who are affected by the recent decision by Potomac Mills. DDOT Announces Delay in 14th Street Changes - As of January 5th, per a DDOT communication, the planned DDOT location changes in the District (14th Street) will be postponed until further notice. It is anticipated that changes will take place by Spring. Any changes will be publicized by DDOT. More information will be provided as it become available. DDOT Releases 14th Street Final Report - DThe District (DDOT) released its "final report" on the decisions they have made regarding the slug lines on 14th Street. Please read the final report and comments on the message board. [Read Message Board thread] or [Read Final Report details]. Click Here for Flyer details. Bob's Slug Line Relocation - Fairfax County recently distributed flyers announcing a temporary relocation of the Bob's slug line due to re-paving of the parking lot effective November 8th. Please see the message board or Click Here for Flyer details. 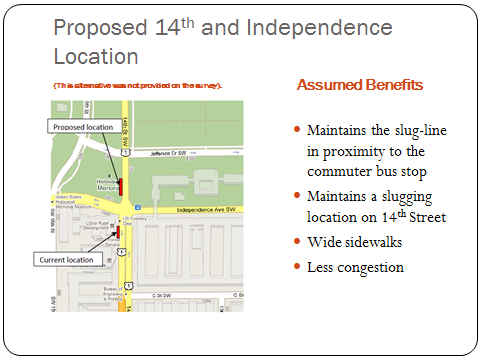 DDOT to meet with 14th St. Slugs! - The DDOT government officials have scheduled a meeting with 14th Slugs on October 26th to discuss solutions for the 14th Street slug line. So many slugs have RSVP'd that the meeting has been moved to a larger conference room. Your voices have been heard! Outcome of Woodbridge and Alexandria VRE Slug Lines - I wanted to take a moment and let you know the outcome of our attempt to get slugging started at the Woodbridge and Alexandria VRE stations on the 19th. Unfortunately, it did not appear that we reached "critical mass" to achieve a sustainable slug line at at either location. As you probably know, for slugging to work effectively there has to be an adequate balance of both slugs and drivers. Everything has to come together for success and our first effort just didn't seem to have enough slugs/drivers. The good news is that is that some people reported slugging either to/from each location. It's up to the slugging community now to get this line to work. Alexandria Slug line Starts October 19th! - The start date for slugging from the Woodbridge VRE to Alexandria is Tuesday, October 19th!. There is a slight change in that the pickup location is not in front of the VRE station (not the Pedestrian Overpass as originally planned). Please help distribute the flyer [Flyer #1]! Slugging Newsletter #16 - We have re-starting the quarterly Slugging Newsletter! This issue had information about the changes to 14th and New York slug line, the new Woodbridge to Alexandria line, and much more! Slugging to Alexandria Starts October19th! - We have set a date to start slugging from the Woodbridge VRE Pedestrian Overpass area directly to Alexandria (Eisenhower Metro or Alexandria VRE). For the first time, slugs and drivers could have the option to end their commute someplace other than the downtown DC area. But, we need your help spreading the word! Please print the flyers [Flyer #1] and let others know! Website Has Signs for Slugs - A longtime slug has created a set of signs designed to help improve both slugs and drivers. The site: www.RuGoingMyWay.us has uniquely designed signs that a driver can display to show slugs the cars destination. Now, instead of walking down the line of cars and asking each driver, you can just see where they are going. Take a look. Slugging to Alexandria! - The slugging community is working on a plan to introduce slugging to the City of Alexandria!!! For the first time, slugs and drivers could have the option to end their commute someplace other than the downtown DC area. But, we need your help!! Please use the Instant Poll on the right margin to vote on what might work best. Also please post comments on the message board. [Click Here to go directly to the Message Board thread]. Dynamic Ridesharing (Slugging) Symposium - The Federal Highway Administration Office of Operations, Arlington County Commuter Services and MWCOG's Commuter Connections, hosted the first ever Washington, D.C. area Dynamic Ridesharing Symposium on July 26th in Rosslyn. This was a ground breaking meeting that brought together slugs, government officials and private industry to share ideas on how to advance Slugging (dynamic ridesharing) in the Washington DC area. The spirit of the meeting was nothing short of total collaboration with discussion on what can be done to improve slugging, overcoming obstacles, expanding slugging in other areas, etc. [Click Here to go directly to the Message Board thread]. New Line - Rosslyn to Rt. 234 Dumfries - A Rosslyn slug is trying to add a new destination of Rt. 234 (Dumfries) to the Rosslyn slug lines. More information to follow, so stay tuned on how we can add this line. [Click Here to go directly to the Message Board thread]. Slug-Lines.com is attempting to arrange an online chat with the Flour Director of Development to discuss the HOT Lanes issue. A date has NOT been set. The idea is to have slug ask questions via the message board regarding HOT and slugging. The new 19th & I St. has started!!! New 19th & I St. line to start August 1, 2005!!! "Tools for School" - A “Tools for School” program is being conducted this year from June 20 to August 15 that helps benefit students in our community. Last year close to 700 families received school supplies for their children. Please take a minute to read the attached flyer and we look forward to seeing you at our office, 13083 Chinn Park Drive, with a donation. Thanks to Corey A. Stewart, Supervisor of Occoquan Magisterial District for letting me know about this worthy cause. Voice your Comments to VDOT on the HOT lanes! - If you are concerned over the High Occupancy Lanes (HOT), then get involved and voice your concerns to VDOT via their comment page. Go to VDOT Site Or, send you comments to them directly at: HOTLanes@VDOT.Virginia.gov Also, there will be an Advisory Panel meeting on concerning the review of the I-95/395 HOT Lanes on July 26, 2005, Arlington County Board Meeting Room, 2100 Clarendon Boulevard Arlington, Virginia 22201. Meeting begins at 7:00 pm. Spamming of Message Board Emails - It was reported that some members of the message board may have received spam emails. Just for the record, Slug-Lines.com does NOT release any emails or names to third parties. In addition, the only broadcast emails are to newsletter members who subscribe to the newsletter. Rosslyn Line to Fredericksburg - Rosslyn has re-established the slug line to Fredericksburg (Route 3 - Gordon Road). It forms on the service road next to the Route 610 slug line. Vote on Horner Road Expansion 3 May 05 - On Tuesday, 3 May, at 7:30 PM, in the Board Chambers of the James J. McCoart Administration Building, One County Complex Court, Prince William, Virginia, the Board of County Supervisors will vote on a formally proposed resolution favoring the conversion of the former PRTC Bus Maintenance Facility, adjacent to the Horner Road Commuter Parking Facility, into additional commuter parking. Occoquan District Supervisor Corey Stewart suggested the same to the Board on 12 April, much to the consternation of more than a few members. Stewart says, your attendance and show of support is crucial. Additionally, per the direction of the Stewart, the County did send a letter to VDoT asking them to belay any sale, pending this resolution and other actions. This provides time to pass the resolution and evaluate the parcel. Opposition to HOT Lanes from Residents - Although two companies who want to build HOT lanes on I-95 tried to convince the approximately 75 residents at a town hall meeting on March 14th, few if any were convinced. Corey Stewart, who represents Occoquan District on Prince William Board of Supervisors, called the session to get public feedback on the proposal. SaveHOV.org - The Committee To Save HOV (SaveHOV.org) has it own website. Committee To Save HOV is committed to saving HOV lanes on the I-95 & 395 Corridor in Northern Virginia. HOT LANES Town Hall Meeting in Prince William County - The Committee To Save HOV (SaveHOV.org) is co-hosting a Town Hall Meeting with Prince William County Supervisor Corey Stewart (Occoquan) to discuss HOT Lanes. HOT LANES Town Hall Meeting in Prince William County - The Committee To Save HOV (SaveHOV.org) is co-hosting a Town Hall Meeting with Prince William County Supervisor Corey Stewart (Occoquan) to discuss HOT Lanes. When: Monday March 14th, Time: 7:00 PM Where: Woodbridge Senior High School - Auditorium. ATTENTION! There is a fake email being sent to people imitating Slug-Lines.com. IT IS NOT FROM SLUG-LINES.COM AND DO NOT OPEN THE ATTACHMENT. The subject is: "Email account utilization warning". Click here for more details. New Slug Line to Route 3 - A new slug line from Rosslyn to Route 3 in Fredericksburg will be started soon. The plan is to start the line on 31 Jan and use the same location as the Stafford line. A flyer and more information will be available soon! Washington Post Article on Hybrids - The Washington Post ran a front page article on Friday, January 7th, 2005 titled As Hybrid Cars Multiply, So Do Carpooling Gripes. [Read at WashingtonPost.com] or visit the Message Board for slug opinions. Dumfries Magisterial District Survey on HOT Lanes!- The website of Maureen S. Caddigan, Dumfries Magisterial District Supervisor Prince William County, Virginia is asking for input on HOT and how they will affect slugging. [Go to Survey] *NOTE - in order to take the survey, you must register for the newsletter first. Apparently, each survey is serialized and coded. RSVP for the HOT Lane Meeting - If you plan to attend the HOT Lane Opposition meeting, please RSVP to hotlanes@scotthirons.com as soon as possible. Space is limited. HOT Lane Opposition Getting Organized - If you oppose the High Occupancy Toll (HOT), then visit two sections of this website: HOT Lanes Discussion on the message board and the HOT Lanes section of this website. New Slug Line in Rosslyn to Rt. 3 (Fredericksburg)? - If you are interested in starting a new slug line from Rosslyn to Rt. 3 Fredericksburg, please take the instant poll (right side of this page) and comment on the message board. Message Board Request - My request to all users is to remember that this website was created to help other slugs and promote slugging as a commuting alternative. Simply put, I envisioned a message board where slugs helped slugs. Since slugging is somewhat dynamic and new people move in and out of the area, I hoped seasoned slugs would help new slugs with this unusual form of commuting. Unfortunately, over the past few months some of the postings on this message board have not been helpful and plain mean spirited. The personal attacks have generated complaints from users and recently a person created a username called Admin. (note the period) in an attempt to impersonate me. I have been extremely selective in deleting postings and banning users from the website. I want to keep a "free speech" forum where people can share their opinion freely. But, some of the posting have stepped over the line and offer nothing constructive (my opinion). I would simply ask that everyone use this forum to help promote slugging and help create solutions not animosity. Prince William County Board of Supervisor Meeting - Disregard the previous posting concerning a meeting on October 19th for the PWC Board of Supervisors to discuss the Horner Road Commuter lot parking problems. This meeting will NOT take place. Mine Road Commuter Lot Reaches Capacity - The commuter lot at Mine Road (Northern Stafford) is reaching capacity causing many slugs to be ticketed. See the full story in the Free Lance-Star [click here]. Return to Rt. 234 from 14th and F Street - Slugs and drivers should be aware that 14th and F Street has a slug line for Rt. 234 in Dumfries. Restart/New Slug Line at Lorton Shell Station - Slugs and drivers are attempting to restart the Lorton Shell slug line. Effective 27 September this slug line will use the Lorton, VA Park-n-Ride lot near the Lorton Shell station. View Flyer. Fairfax Commuter Lot Update - Construction of a new Park and Ride Lot at the Intersections of Hooes Road and Gambrill Road began on May 3, 2004 and is expected to be completed June 2005. The new commuter lot "Gambrill Park & Ride" facility will include a paved and lighted bus shelter, 223 parking spaces and accommodations for bicycles. A storm management basin and landscaping were designed into the project. Access will be available from Gambrill & Hooes Roads providing convenient access to and from the Fairfax County Parkway. Overflow Parking for Horner Road - Because the Horner Road lot reaches full capacity daily, many commuters are parking on the shoulder of Telegraph Road. An option for slugs and drivers is use the Potomac Mills slug lines. There ample parking and plenty of options to getting downtown. Rolling Valley from L'Enfant Plaza - If you are heading to the western side of the Springfield area, consider L'Enfant as a source for slugs. At times, there are plenty of slugs but not enough drivers! Drivers Solicited Money from Slugs - A slug reported on August 31st, that after slugging from 14th and New York to the Horner Road commuter lot, that the two men she was riding with asked her for $5 for the ride. After she refused, one of the men stated they were joking, but she was convinced they would have accepted the money. Unfortunately she did not get a license plate number. Bob's at Springfield Needs Riders - A driver from Springfield has noticed an imbalance between slugs and drivers - plenty of drivers with fewer slugs. If you heading to L'Enfant, consider slugging from Bob's! Double Parked Maniac - A great new story about squeezing into a parking space...and the aftermath! Read story. Mine Road Lot Parking - It has been reported that the Mine Road commuter lot is reaching capacity while the older 610 commuter lot still has parking spaces remaining. Since nobody wants to have their car towed, a suggestion was made that early morning slugs/drivers (before 7:00 am) use the older 610 lot and later slugs/drivers use the Mine Road lot. In this way, it might help with the congestion. Route 630 Line Not Operating - The slug line at Route 630 was reported as not operating. The webpage has been updated to caution new drivers and riders. Crystal City Traffic Pattern Changes - On June 26th the Crystal City traffic pattern between 23rd and 15th Street will change to allow two way traffic on Crystal Drive. Since the slug lines are on the northern end of Crystal Drive, near 12th street, this should NOT impact slugging. View Flyer. L'Enfant Plaza needs Rolling Valley Drivers - It was reported that more slugs than drivers are at L'Enfant Plaza. So, if your headed to Rolling Valley, consider picking up a slug at L'Enfant! Springfield Area Slug lines - An effort is being made in a to get a new slug line started in the Springfield Mall / Kingstowne areas. They have been very active and already have flyers printed. There has been tremendous interest in getting this line started over the years and it would be a great benefit for everyone! There are a couple of threads on the message board. Slug-Lines.com acquires SlugVirginia.com - Although this sounds like a hostile takeover it wasn't! Chuck, who ran SlugVirginia.com for many years, moved to Florida and decided to pursue other interests. Chuck offered the domain name to me to prevent the "website not found" error and to redirect users to Slug-Lines.com. A sincere thanks to Chuck for his many years of supporting slugging. Your efforts will have a lasting impact to the slugging community. Kingstown (Springfield Mall area) - Lot's of interest to create a line east of the Bob's slug line in the Kingstown or Springfield Mall area. 18th and ?? - The exact location is still to be decided, but the new line would be farther up on 18th street and service Horner Road. New Automated Slug Matching System - In some areas, slug/drivers are "matched" via email coordination. Usually this is done via an email list server or somebody just volunteers to do it for everyone in that area. A new web-based automated system may be added Slug-Lines.com to make this process simpler!! A smart computer programmer has volunteered to see if this process can be automated. More to follow, but its an excited feature to help slugs! How is the Horner Road Working? - Although it has only been in effect one day, how is the split working? Leave comments on the message board. Click Here! Horner Road Lines Split! - Effective Wednesday, April 21st, the slug lines in the new section of the Horner Road commuter lot will split into two (2) separate lines. There were a number of great suggestions but Option 2A seem to have the most support as long as the Navy Yard and L'Enfant lines were kept together. Below is a flyer/map of how the slug lines will be split. Please reproduce and distribute as much as possible! VDOT has helped by placing electronic signs at the lot to help notify drivers and direct traffic! Over 3700 people viewed the suggestions and some 100 replies were made on the MESSAGE BOARD (click to view). Sincere thanks to everyone who made suggestions. Many slugs/drivers had some great ideas. I really tried to get everyone's suggestions posted on the website. Horner Road Options - A meeting was held on 24 Mar with the PWC police department and traffic management to present some of the suggestions by slugs for relieving the congestion in the new lot at Horner Road. They were very supportive of slugging and willing to help slugs implement changes to make the system operate more efficiently. Here are some of the options. PLEASE EITHER VOTE ON THE POLL OR LEAVE COMMENTS ON THE MESSAGE BOARD. Help and Suggestions Needed for Horner Road! - On March 12th a number of citations were issued at Horner Road Commuter lot due to the traffic overflowing onto Telegraph Road. Perhaps we can coordinate a mutual solution with Traffic Management but your suggestions are needed on how to fix the traffic problem! Leave suggestions here! Caution with Fake Emails - Do NOT open the email attachment with the title "Notify from e-mail technical support" that appear to come from Slug-Lines.com. I did NOT send out the email below and it quite possibly contains a virus or a spam type application. Delete it. This is what it says (notice the incorrect spelling of the word amount...). our free anti-virus tool to clean up your computer software. CBS News Correspondent Steve Hartman's "Everybody Has A Story" - On March 11th, 2004, Mr. Steve Hartman featured a slug and slugging on the "Everybody Has a Story" program on the CBS Early Morning Show. Great interview. More Info. Two New Slug Stories - See Slug Stories. Slug Story "Talkative Driver" - A new slug story. See Slug Stories. Newsletter Released - The most recent newsletter is being sent to over 1800 newsletter subscribers. This edition includes information on HOT Lanes, status of new slug lines, and more! New 14th and H Street Slug Line - 14th and H Street has a slug line that appears to be here to stay. Over the past year this new line that services only Bob's at this time, runs from 3:30 p.m. to 6:00 p.m. but the best times are around 4:00 p.m. to 5:45 p. m. A new page will be created in the next few days to support this line! Slug Story "Sleeping Beauty" - A new slug story. See Slug Stories. DC Police and L'Enfant Plaza - It was reported that on Thursday evening, Jan 8, 2004, DC Police were patrolling the slug-lines at L'Enfant Plaza on 7th and D St, SW. The patrolmen were discouraging slugs from standing on the sidewalk to get rides to Springfield, Horner Rd, and Rt 610. They said the cars stopping for slugs were causing congestion on the main street. New Slugging Poems - Fellow slug and driver Florence Rosie Givens, has written poems about slugging for a number of years now. See her latest poems. Route 610 Page Updated - The new Mine Road slug line is going strong as a result of the efforts of some motivated slugs/drivers. Now once the "old lot" reaches parking capacity, the overflow moves to the "new lot" and so does the slug line! See Stafford 610. "...But in the past six months, the idea of high-occupancy toll, or HOT, lanes has gained traction faster than almost any other traffic congestion-fighting measure. The details of how to create them -- and how to spend the toll money -- still stir debate. However, with money tight and traffic growing worse, HOT lanes are now widely viewed as one of the most feasible, affordable ways to better manage, if not ease, traffic congestion in the short term while generating money for long-term relief. ,,,"
Carpool Cheaters Website - There is a new website in California that targets carpool cheaters called www.carpoolcheats.org. Hmmm....maybe DC needs a site like this. Help Promote Slugging - One of the challenges with Slugging is letting people know it even exists. With new people arriving to the area and existing residents relocating from areas where slugging doesn't exist, take a minute to suggest they consider slugging as an alternative. Use this website as a source of information for them or explain how the system works. Slugging continues to grow but it's a community based effort! Slug Story "The Buses Only Lane" - A new slug story. See Slug Stories. Pentagon Slug Line Update - The following information was just provided to Slug-Lines.com from the Pentagon regarding changes to the slug lines. Although this is another change, they are working hard to get slugging to work at peak capacity. See statement below and New Map! The following Slug Lanes shall be relocated effective the 24th of November 2003 SPRINGFIELD / BURKE / TACKETT'S MILL / MONTCLAIR / ROUTE 234 / HORNER ROAD / POTOMAC MILLS PLEASE REFER TO MAP INDICATIONS"
New Springfield/Burke Line at Rosslyn - Rosslyn has added a new line for Springfield/Burke commuters. BUT, it's not co-located with the other lines!! See Flyer details or visit the Message Board for discussion. Slugging in Dublin, Ireland? - Maybe...Irish TV taped a story on slugging on 5 Nov to air in Ireland in the next few days as a possible solution to Dublin's traffic congestion. L'Enfant Plaza Adds Tackett's Mill - Those who use L'Enfant Plaza may be able to slug to Tackett's Mill. Once the Horner Road destination was added a few weeks ago, there have been reports off people slugging directly to Tackett's. Springfield Mall Line to Start Nov 10th - View New Flyer! A new line from the Springfield Mall will be started starting November 10th. See the Message Board for discussion and details. Slug Story "The Slug and the Case Worker" - A new story about a slug who confides in a driver about someone who happens to be that person's case worker... See Slug Stories. New Springfield/Burke Line at Rosslyn - Beginning 20 October 2003, Rosslyn will add a line to the Springfield/Burke area. See Flyer details or visit the Message Board for discussion. New Crystal City to Springfield Line - A number of people are interested in starting a new slug line from Crystal City to Springfield beginning 23 October 2003. See Flyer details for more details. L'Enfant Adds Horner Road Line - L'Enfant Plaza now has a Horner Road line! The new line started around the first of Oct and forms next to the Rt. 610 line. Now, those going to Horner do not have to travel to the Pentagon! See the Message Board for discussion. Pentagon Slug Lines Being Relocated - Effective on 6 October 2003 many of the slug lines at the Pentagon will be relocated to North Rotary Road between lanes 31 thru 36. The move, detailed in the Building Circular PBM-03-29, will provide a "safer environment for commuters and help to alleviate traffic congestion." In addition, the Pentagon officials stated they will shelters for slugs as well as emergency phones. View Building Circular PBM-03-29. Street Closing Could Affect Slugging - Beginning 22 Sep some of the streets in downtown DC will close during the filming of "National Treasure," a film starring Nicholas Cage. See the Message Board for details. New Springfield Mall Flyers - See links below for the new slug line trying to get started at the Springfield Mall. View Flyer. New Springfield Slug Line - A new slug line is being developed by a few people in the Springfield Mall/Kingstowne area. Currently, the slug line will use the commuter lot between Springmall Rd and the JC Penny south parking lot (non-garage lot). See the message board thread for Kingstowne/Alexandria for details. Montclair Added to Slug Groups - The Montclair area now has a "Slug Group". For more info see Slug Groups. New 610 Line to form at 19TH and F ST NW DC- A new slug line destination is underway at 19th and F St. NW in DC for those using the 610 commuter lot in Stafford. See the message board for details. More info on the I-66 Herndon/Reston slug line (24 July 03) - The people behind the new Herndon/Reston to Rosslyn slug line are working hard but need DRIVERS. See the message board for details or visit the website (www.slugline.org) they created to get this line up and running. Herndon/Reston to Rosslyn Slug Line! (12 July 03) - A new slug line from Herndon/Reston to Rosslyn is developing. See the message board for details or just click here. HOT Letters (23 June 03) - There are some examples of letters written to government officials regarding the HOT lanes. Click Here. Webmaster Relocating (23 June 03) - I am in the process of moving to our new home in Lake Ridge, VA this week. As a result, my ability to update the website and respond to emails may be interrupted until we are settled in our new home. Do High Occupancy Traffic (HOT) Lanes Threaten Slugging? (8 June 03) - There has been a lot of discussion regarding the momentum behind High Occupancy Traffic (HOT) lanes. Do they threaten Slugging? More information will be available with who to contact in you local government. See the forum thread "HOV to HOT"
See the forum thread "HOT Lanes"
Commuter Survey (2 June 03) - A short commuter survey is being conducted by the Fredericksburg Regional Alliance. They even said they would include questions regarding slugging! If you live in the Fredericksburg area please consider taking the survey. It may take you 1-2 minutes! See it at: www.surveyhost.com/commuter. Possible Slug Line at Kingstowne? 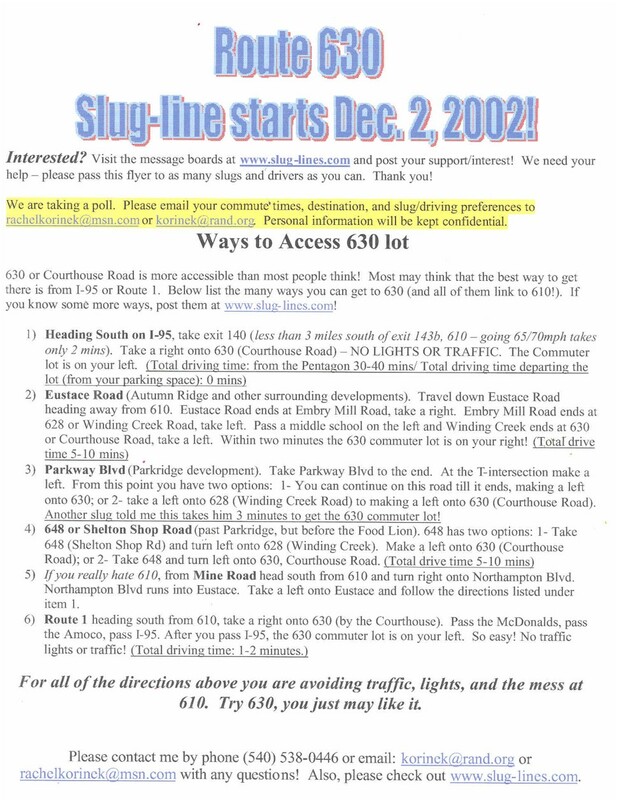 (20 May 03) - A new slug line is being considered for the Kingstowne area. If you are interested add your email to the Kingstowne Slug Group and/or provide you comments to the forum message thread. Dangerous Crossing at Bob's (20 May 03) - There is some concern with the way slugs cross at Bob's (Springfield Plaza). See comments on message board. CNN Headline News Reports on Slugging (8 May 03) - Slugging received national news coverage on CNN Headline News last night at approximately 8:20 pm EST. During the three-four minute segment, the CNN news anchor discussed the amazing slugging phenomena occurring in Washington DC and Northern Virginia. Also discussed were its many advantages and benefits to the local area. Hopefully, my interview presented slugging in the best way possible and that viewers were left with not only a good impression but a willingness to at least try slugging. New Line at 14th and H Street? (1 May 03) - The 14th and H Street (near 14th and NY) may be developing a new line for Bob's. A recent email stated that "The Bob's line forms at the orange newspaper box at the corner of 14th & H."
New York Times Article on Slugging (29 Apr 03) - The New York Times recently wrote an article about Slugging titled "To Commute to Washington, the Early Bird Gets 'Slugs'" (29 Apr 03) by Peter T. Kilborn. Read the article at the NY Times (free but requires registration). 14th and G Street Updated (24 Apr 03) - The 14th and G Street page was updated to reflect the Rt. 610 destination. Apparently, this location has supported 610 slugs and drivers for some time but it wasn't listed on the site. See 14th and G.
Send Corrections or Update (24 Apr 03) - To help keep this site accurate please send corrections or updates to the webmaster. Send Email. Newsletter #12 Distributed (23 Apr 03) - Most recent newsletter distributed to all subscribers on the mailing list. Visit the Lost and Found (8 Apr 03) - There are numerous lost and found items that have remained unclaimed. Please visit the Lost and Found and maybe you'll recognize something that a friend is missing. Want to Start a New Slug Line? (8 Apr 03) - With the warm weather approaching, there has been a lot of discussion about starting some new slug lines. Please visit the message board for new slug line discussions. Click here. Problems Accessing the Site? - If anyone has difficulty accessing the message board, please contact the administrator at: webmaster@slug-lines.com. Although there has not be any reports, the new security software may block certain IP addresses by mistake. The Stinky Ride (27 Mar 03) - Short story from a slug. See Slug Stories. Rolling Valley now Supports Rosslyn (21 Mar 03) - Those traveling to Rosslyn from the Springfield area now have another slug line to use: Rolling Valley. Thanks to Nora for sending the email regarding this new line! Additional Security Added to Website (12 Mar 03) - As a result of some obscene comments and improper postings on the website additional security features have been installed. Hopefully this will keep the website clean and useful for everyone. Name Changed to Rt. 234 (12 Mar 03) - The recent "instant poll" conducted on the website revealed that the most commonly used name for the slug line on Rt. 234 and Dumfries Road is "Rt. 234". As a result, the name has been changed on the website. Is Dumfries Road really Rt. 234? - What is the name most commonly used to describe the Dumfries Road or Rt. 234 commuter lot slug line? It has been called a few different names but what is the most common? Please take the "Instant Poll" on this page. See right side. The Gainesville Citizen (21 Feb 03) - A great article appeared in on page 15 and 17 of The Gainesville Citizen regard Slugging. Read it on their site. 42 Lost and 22 Found Items posted on the Lost and Found Page (3 Mar 03). - And, there are hundreds listed in the archived database. See Lost and Found. Remember! The new Slug Line forming at 14th and G St. Started 3 Feb - The new slug line forming at 14th and G St. started, 3 Feb 03. The destination is for Route 17 Fredericksburg/Stafford as well as Rt 610. See flyer or visit the webpage. High-Occupancy Toll (HOT) Study could Impact Slugging (17 Jan 03) - An article in the Washington Post on January 16th discussed a proposal being studies to charge a toll to lone drivers to use the HOV! See message board for discussion! New Star Rating System (22 Dec 02) - A new star rating system has been introduced to help evaluate slug lines!! Hopefully this will help others determine which lines to use. Visit you favorite slug line web page and cast your vote! You can even leave comments to tell others the good (or bad) things about the line. See Slug Rating System. Robbery Attempt at Potomac Mills (15 Jan 03) - Please see the message board for details! Newspaper Article (14 Jan 03) - The Star-Ledger recently wrote an article about slugging as a method to help New York City's public transportation problem. Read Article. Robbery at the American Legion Commuter Lot (3 Jan 03) - I was notified by email of a robbery that took place on 30 Dec 02 at the American Legion Commuter Lot as a slug was walking to her car. See Message Board. T'was the Slug Before Christmas Poem (20 Dec) - A fellow slug sent in a funny poem that's bound to make you laugh. See Poems. Solicitations on Message Board (19 Dec 02) - Solicitations or other marketing and sales items should not be placed on the message board. Things of this nature may however be added in the "Classified Ads" section of the website. Atlanta Journal-Constitution Article (10 Dec 02) - An Atlanta report, so intrigued by Slugging, traveled to DC just to get a story. Click here to read story. Seattle Washington Promotes Slugging - The Seattle Times wrote an article about Seattle's efforts to encourage casual carpooling. Read the article. Remember Route 630 Line Starts 2 December (30 Nov 02) - See previous 12 Nov 02 announcement below. Computer Error on Website (25 Nov 02) - A computer error was discovered on this site which prevented the "feedback form" from working properly. As a result, messages sent using the form were never delivered! My sincere apologies to anyone who tried to contact me. Problem is fixed. Route 630 Line to Re-Start 2 Dec 02 (12 Nov 02) - The slug line at Route 630 in Stafford will start again on 2 Dec 02. If you are interested in supporting this line please contact rachelkorinek@msn.com to get on the mailing list and additional details. See .pdf flyer. November Newsletter Released (12 Nov 02) - The November Slug-Lines.com newsletter was published on 10 November 02. If you didn't get your copy be sure to sign up before next month! Tackett's Mill Line (12 Nov 02) - There is a real debate on whether Tackett's Mill should have one or two lines. Please take the "Weekly Instant Survey" to voice your opinion. Amazing Lost and Found Item (5 Nov 02) - An item was re-united with its owner after being on the "found" list for 1 year, 6 months, and 22 days. That's got to be a record! Darlene learned of the website's "lost and found" recently and discovered a "found" listing on the same day she lost here rings some 1.5 years ago. She contacted the man who posted the items and now she's re-united with here very sentimental rings. Many thanks to Mr. Hennessy for posting the item and keeping them in safe storage! Website has 488,421 hits in Oct (4 Oct 02) - This website had 488,421 hits last month which is an indicator of the popularity of slugging. Keep on slugging! New Slug Story "Pepto Bismal" (31 Oct 02) - It could happen to you! Click here. Website Upgraded (29 Oct 02) - A number of upgrades have been installed on the website. Details in the next newsletter. New Slug Story "First Impressions" (24 Oct 02) - A new story on why slugs shouldn't talk...especially if you are planning on testifying to a Congressional subcommittee! Click here. Lorton Road Parking Area to Re-Open - An email sent yesterday stated that the parking area off I-95 and Lorton Road is scheduled to re-open 25 Oct 02. This would certainly help Lorton sluggers! NuRide Offers Program for Sluggers! (23 Oct 02) - A new program created 21 Oct 02 could help Sluggers by paying them to commute! Yeah, imagine that, getting paid to commute! Right now its open to Rolling Valley slugs with more info to follow. Get more info at: www.NuRide.com. New Shuttle Bus Service for 610 Stafford (21 Oct 02) - A trial shuttle bus service has been created effective 21 Oct to help accommodate slugs who need to move from the North 610 Commuter Lot and the South 610 Commuter Lot. See pdf version. Stafford Board of Supervisors Meeting - The Stafford Board of Supervisors will meet on November 5th at 7 pm to discuss and vote on the 610 Shuttle Bus Service. See Events Calendar. Crystal Park 2 to Start (14 Oct 02) - Crystal Park 2 (not used for some time) will start 1 Nov 02. If you work in South Crystal City give this line a try! New Rt 630 Effort in Stafford (14 Oct 02) - Slugs are using Rt. 630. See 2 pages of flyer for information and directions!. Click here. New Rt. 610 Lot Flyer (8 Oct 02) - A new flyer was created for those moving the 610 Slug line in Stafford from the Staffordborough Commuter lot to the Mine Rd lot. Hit and Run Accident! (2 Oct 02) - A fellow slug's car was "hit and run" while it was parked at Hwy 17 . See comments posted on Message Board. Drivers Needed at New 630 Lot (25 Sep 02) - The slug line at Route 630 is growing but slugs outnumber drivers. Bottom line: more drivers are needed. Are the two lines working at Horner Road? (25 Sep 02) - Some say its working great and other say it's not working at all. Give your opinion on the message board topic 230. New Line at Route 630 due to changes to Route 610 Parking may Start (20 Sep 02) - A fellow slug is circulating the flyer below as a result of changes being made to the parking at Route 610. The flyer has 23 Sep 02 as a start date. Click here for message board for more info and comments. Download flyer. Horner Road Hot Button (19 Sep 02). This proposed split has become a real emotional issue - some slugs/drivers love it and others hate it. The idea to split the line was from slugs and drivers unhappy with the long lines and not some outside agency. The intent was to make Horner Road better and more efficient. Some say its working great and other say it's not working at all. Remember Slugs are in charge. Voice YOUR opinion on the message board topic 230. Cannot View Flyer? (29 Aug 02) . If you do not have Microsoft Powerpoint you can still view the flyer by downloading and installing the free viewer. New Horner Road Lines to Start. Effective 17 September 02, the Horner Road commuter lot (exit 158 of I-95) will create a second slug-line to accommodate the growth of slugging. The original single line has become so popular that it has effected both safety and efficiency. To better serve the slugs, Horner Road will create a second line in the "New Lot" recently completed. 14th at Commerce Dept adds Line (8 Sep 02). The 234 Commuter Lot line is growing in popularity at 14th at Commerce Dept. Now this location has three (3) lines supporting slugs. See 14th at Commerce Dept. September Newsletter Released (5 Sep 02). The September Newsletter was distributed today to get back on the first week of each month schedule. And, more importantly, it contains some great information about Flexcar incentives and other slugging stuff! Horner Road Survey Mixed (5 Sep 02). As of 4 Sep 02 the survey about whether splitting Horner Road into two lines is mixed. About 55% like the idea and 45% don't. What do you think? New Line at Hamilton Square (29 Aug 02). A slug recently reported that he has been successful in slugging from Hamilton Square (14th and F) to the 234 lot. August Newsletter (29 Aug 02). The August Newsletter was distributed on 28 August with lots of information. View now. Slug-lines.com Partners with Flexcar (1 Aug 02). I am thrilled to announce an exciting opportunity for all Slugs, and a wonderful new partnership for Slug-Lines.com. Effective August 1st, Slug-Lines.com is partnering with Flexcar, the nation’s premier car sharing program, to address two of the possible weaknesses of slugging: what if I need a car during the day, and how do I get home if I work late? Read More. HOV lane Violators are Becoming a Common Sight on Area Roadways. Steve Eldridge (Sprawl and Crawl) answers a question on HOV violators. Read article. New "NextBus" Technology (1 Aug 02) CommuterPage.com has information on a new technology called "NextBus" that tells you in real time when the next bus will arrive at your bus stop. Read article. Click here for more archived "Hot Updates"